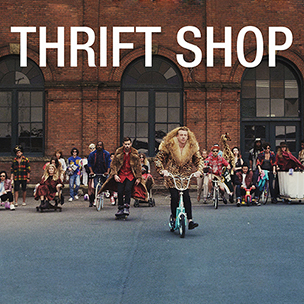 Macklemore and Ryan Lewis’ breakout single “Thrift Shop” has been certified platinum, according to RR. The upbeat anthem marks the first platinum plaque for the Seattle, Washington pair. The duo has been on the independent grind for years, most recently releasing their joint studio debut The Heist that debuted at No. 2 with 78,000 copies sold back in October. The video for “Thrift Shop” pushed the song into the mainstream strata. The self-helmed clip debuted on YouTube in late August, racking up more than four million views in less than a month. As of now, the clip has upwards of 42 million views and the track sits at No. 10 on the Billboard Hot 100. UPDATE: Less than a month after earning platinum certification for their breakout hit “Thrift Shop,” Macklemore and Ryan Lewis have hit another milestone. Billboard.com reports that the track, which sits atop the Hot 100 for the second consecutive week, has been certified double platinum with 2.3 million digital downloads.